This is a fresh take on an old blues song written way back in 1913 with guitarist/singer Dave Blenkhorn on an old charlie christian Gibson guitar. Roger Biwandu (drums) and Herve Saint-Guirons (B3 Organ). 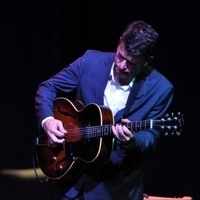 Australian guitarist and singer Dave Blenkhorn has been a regular on the european and international scene for the past 15 years and has performed with some of the finest players around including John Faddis, James Morrison, Scott Hamilton,Harry Allen, Evan Christopher and Cecile McLorin Salvant. His love of blues and swinging reveal the influence of guitarists Charlie Christian, Django Reinhardt, Barney Kessel and Wes Montgomery. He has been a popular choice for many soloists from the US and europe alike playing at many of the major festivals around europe.